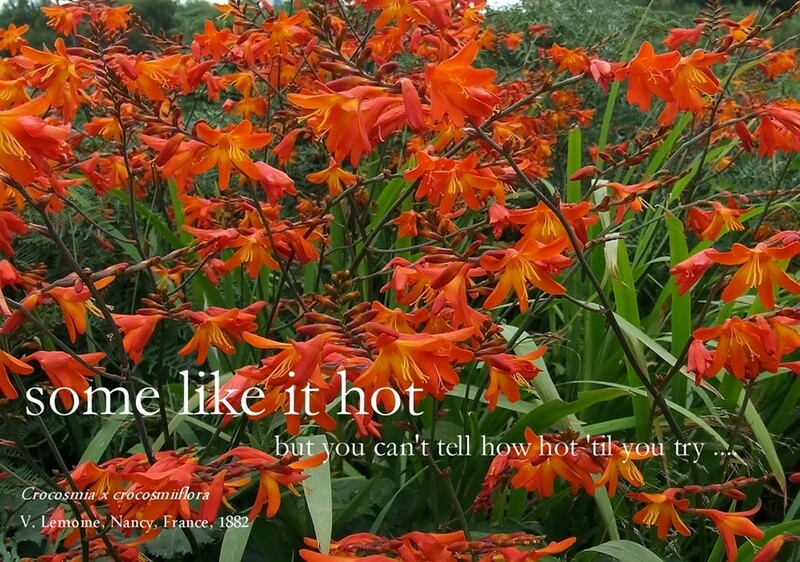 Waterfalls of fire is how I describe a time of the year that for six to eight weeks the hybrid 'Crocosmia X crocosmiiflora' or as it is more traditionally known as 'Montbretia crocosmiiflora', puts on its striking display. A common plant that can be seen growing in small patches all over the Western areas of the Wairarapa, but it saves its best show blooming on the sides of the narrow and winding roads in the district of Mangamaire.The photos where taken 15 days ago which was about the middle of the bloom season. Easy to grow and undemanding of care and soil, the plants have curving sword shaped leaves, broad trumpet-shaped flowers with widely open and flaring tepals and it's tell tale ring of small V-shaped crimson markings around the flowers centre. A primary hybrid from a cross Crocosmia aurea X Crocosmia pottsii and a winner of the Royal horticultural Society First Class Certificate 1883. Superseded by larger flowered cultivars. I grow a small colony of 'Crocosmia X crocosmiiflora' and its self seeding can be controlled by dead-heading the blooms, and just recently I have purchased 50 bulbs of the hard to come by 'Lucifer' which was selected from hybrids created by crossing C. x crocosmiiflora 'Jackanapes', with C. paniculata and C. masonorum, can also come true from seed and self seed, its a Alan Broom 1969 selection. 'Lucifer' was awarded the RHS Certificate of Preliminary Commendation, 1977, an RHS Award of Garden Merit in 1993, and named '2010 summer bulb of the year' by the Netherlands Flower Bulb Information Centre. Both varieties are super useful as a cut flower. Crocosmia the species is from the summer rainfall forests and grasslands of eastern Southern Africa and parts of tropical Africa and Madagascar and is a genus in the Iridaceae family. Nicholson, Illustrated Dictionary of Gardening 4 : 94 (1888), as "T. crocosmiflora". 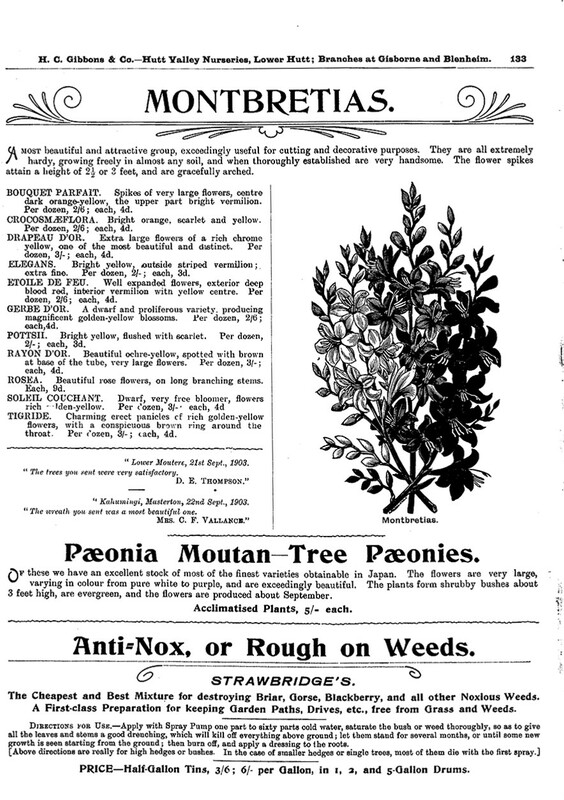 Volume III is a "weed flora". Much of the text is devoted to two large groups, the rushes and the sedges with their green or brown insignificant flowers, which are always a problem in agriculture, difficult to identify individually, and in which the native species cannot easily be distinguished from introduced ones and are equally weedy. In contrast many garden plants of the lily, iris and related families are included, ones which have escaped into the wild. They make splashes of colour on roadsides and waste places, and among the brightest are watsonia, montbretia, wild ginger, and Kaffir lily. 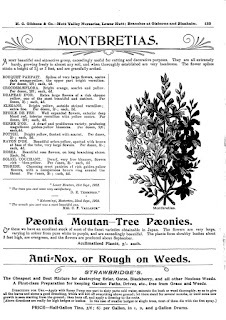 This book is an identification manual, intended for agriculturalists concerned with weed control, for botanists making vegetation surveys, for anyone, in fact, who needs to identify these weedy plants. Keys cover monocotyledonous introduced and native genera (except grasses), and introduced and native species when both occur in the same genus. There is also a key to families and some genera based mainly on vegetative characters. 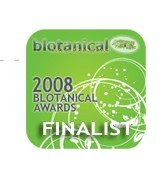 Historical background too is provided, for the plants have been an ever-increasing component of the flora of New Zealand. For each species the first published record of its occurrence in New Zealand is cited, together with the present known distribution. The mode of dispersal and other ecological data relating to the more aggressive species are discussed, and comments on their significance as weeds are included. Stiff, leafy, clump-forming, rhizomatous, 60-90 cm high. Corm ± 3.5 × 1.5 cm, flattened; tunic fibrous, light brown, 3 or more successive corms at base of shoot. Leaves firm, ± erect to curving above, ± 2 cm wide, slightly < flowering scape, outer short and sheath-like at base of stem, with basal fan and a few cauline leaves, midvein ± conspicuous. Inflorescence 15-30 cm long, cymose, branches few, axis zigzag; spathe-valves reddish-purple-brown, ± 5 mm long at flowering, lengthening to 1 cm at fruiting. Flowers reddish-orange, ± 3 cm long, 4-5 cm diam., ± distant; tube narrow, 1 cm long; lobes spreading above, outer deeper coloured on back, subacute, inner obtuse, one wider than other two. Capsule ± 5 mm long, green, oblong-trigonous. Seeds c. 6 at maturity, ± 3 mm long, reddish-brown, compressed-triangular, surface minutely papillose. N., S. Throughout. St. Oban. On roadsides and waste land, a garden escape well-naturalised. (Artificial hybrid, Crocosmia aurea × pottsii made by M. Lemoine of Nancy; (see André Rev. Hort. 54, 1882, 124-125). First record: Allan 1935: 3, as "C. aurea Planch." First collection: "Puriri, Thames, alluvial land, H. Carse, late Jan. 1929, common on banks of streams in the Thames District" (CHR 3531). This hybrid Crocosmia was commonly planted in gardens, and about cemeteries in earlier years, and some forms proved troublesome, spreading rapidly from corms and rhizomes. Disposal of surplus corms to roadsides and waste places has given rise to widely occurring, well established colonies in grassy situations, especially in some west coast, South Island localities. Road construction and use of roadside soil as fill have been responsible for some extensive communities; corms are dispersed locally by graders, and by water in roadside drains. C. X crocosmiiflora is listed above as CROCOSMÆFLORA, H. C. Gibbons & Co. Hutt Valley Nurseries, Lower Hutt, New Zealand, 1904. Edgar, E and A.J. 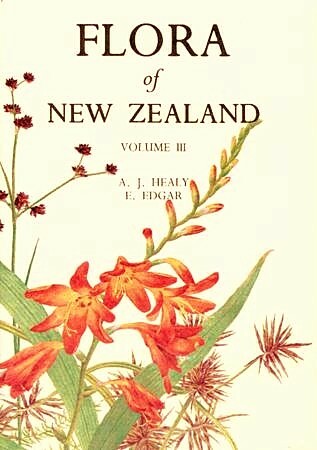 Healy (1980) Flora of New Zealand Botany Division, Department of Scientific and Industrial Reserch, Government Printer, Wellington, New Zealand. Amazingly 17 years (Is it really that long ?) after the wildly coloured masterpiece 'Bewilderbeast' exploded on the Iris world stage with its 'get this' attitude it is still one of Brad Kasperek's best efforts to date. Its fantastic splish splash of red-purple decorate mustard yellow edges that fade to creamy white toward the center. This attention getter also has a sweet fragrance, and good bud count. Once established it becomes a strong grower but in saying that it took me three attempts to get this iris to grow, and it can be a shy bloomer some years. All and all a fickle iris but when it blooms all the problems are quickly forgotten (until the next time).These broken coloured irises are now starting to be referred to as 'Tie Dyed Iris' probably because no two blooms are exactly the same. IRISES, A Garden Encyclopaedia, Claire Austin. This flower is a psychedelic mixture of colours, including maroon, mauve, and cream. These colours sit in rivers across the white background. The standards are muted in tone, and the thin beards are dark yellow. Height 76 cm ( 30½ inches). Bloom ; mid-season. Parentage Tiger Honey X Rustic Dance. BEWILDERBEAST (Kasperek 1995) M. 30"
BEWILDERBEAST (Brad Kasperek, R. 1994) Sdlg. 91B-2A. TB, 30" (76 cm), M ; S. streaked light mauve (RHS 61A) and silver white (155C); F. dark mauve (61A) with silver white streaking, sunshine yellow shoulders with mauve veining; beards golden brown; laced, lightly ruffled; slight fragrance. Tiger Honey X Rustic Dance. Zebra 1995. HM 1997, AM 1999 . 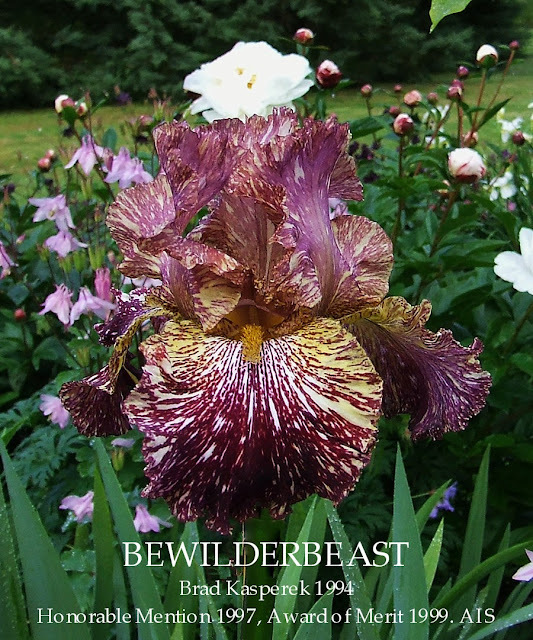 If you like these irises,visiting the Zebra Gardens web site is a must do. Named after Henry Shaw (1800--1889), a native of Sheffield, England who made his fortune in hardware outfitting trappers and settlers entering the Louisiana Purchase Territory via St. Louis. In 1859 he donated his 79-acre country estate for "all time for the public benefit ". This garden is today the Missouri Botanical Garden, and is the oldest botanical garden in continuous existence in the United States. 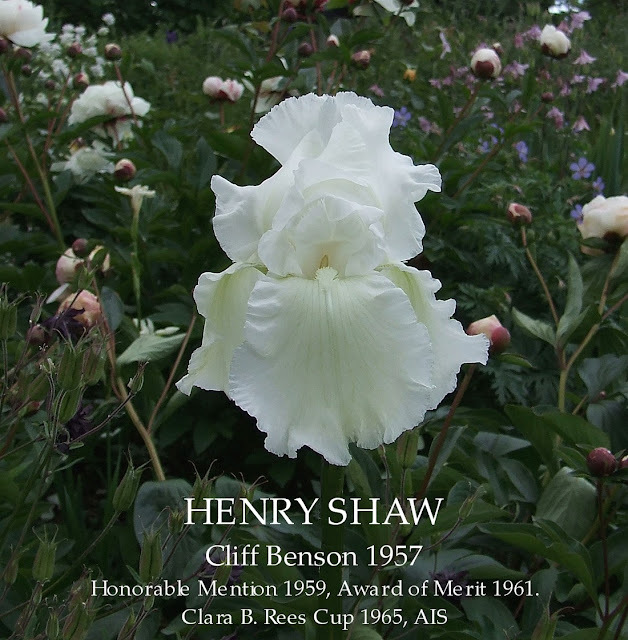 Cliff Benson introduced the white TB 'Henry Shaw' in 1959. It is a pure white self with a green undercast that follows through and a flawless snowy white beard, winning an Honorable Mention from AIS in 1959 and an Award of Merit in 1961. With Snow Flurry in its pedigree it was more than appropriate that Henry Shaw, was the first winner of the Clara B. Rees Cup in 1965 for an "outstanding white iris". We purchased this heirloom iris many years ago from Lynne Atkins of Greenhaugh Gardens fame, now there is a garden to visit !!! Cliff W Benson, Route 3, Baxter Road, Chesterfield, Missouri, Introducing for 1959. 'Irises' by Harry Randall, Chapter 9 Famous Tall Bearded Parents. A fascinating exercise for Iris breeders is to study the records and prepare pedigrees for their favourites. These can be an elaborate form adopted in our history books to press the ancestry of Kings, or in the simpler form adopted in the book of Genesis. Using the simple form, I can recall that Snow Flurry crossed with Katherine Fay produced New Snow. When this was crossed with the pale blue Cahokia it 'begot' Cliffs of Dover, which is been the most popular white in Britain for some years ; and when this was crossed with Marion Marlowe it gave Henry Shaw. From Henry Shaw came Arctic Fury which is producing some wonderfully fine seedlings of which we are certain to hear in the years ahead. I do not claim nor could it ever be proved that all the good qualities of these five generations of seedlings came from Snow Flurry, and a few people would doubt my contention that they might neither have appeared in our gardens but for her influence. Three of those named above -- New Snow, Cliffs of Dover, and Henry Shaw-- have already won Awards of Merit in the United States, and their descendants will be considered for that honour when they have been on trial for a sufficiently lengthy period and in a wide range of gardens in different States. The pedigree given could with variations, be duplicated very many times to show the beneficent effect of Snow Flurry on large numbers of modern Irises, and to indicate our indebtedness to Clara Rees. 'Irises' by Harry Randall, Chapter 12 Irises Already Popular. AIS Bulletin #166, July, 1962,'The Modern White Iris', page 10, Mr. Cahey E. Quinn. HENRY SHAW is Cliff Benson's white offering for 1959. I think this is his best. As with most modern iris, it has excellent substance. The flower is also heavily ruffled, a pure white with a white beard. Proportion, balance, vigorous blue-green foliage-these are the features that make HENRY SHAW desired by everyone. REGION 14, Regional Bulletin Northern California, Nevada, Fall 1962.“Varietal comment”, page 23, Donald L. Artz. HENRY SHAW C Benson 1959 M. 38"
"As pale as the morning star as it flickers in the quickening light of dawn. I have never seen such luminosity, and this sprinkled with the dust of mother-of-pearl." STARSHINE (Jesse Wills) Commentaries in Variety, Anthony W. Drewett, The Iris Year Book 1949. Fairmont Gardens, Lowell, Massachusetts,Irises, Hemerocallis, Hostas, Poppies, 1950. STARSHINE Wherever I saw this iris it put on its ‘Sunday best’ for me – upright stems and well spaced flowers of exceptional flaring form. It’s soft colouring needs a artist to describe, but I noted it as pearly-cream. In my own garden I crossed it with ‘TRULY YOURS’ and it will be interesting to see the results. 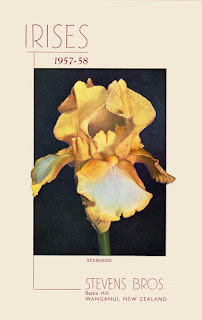 Tell Iris Gardens, Iris Catalog and Hybridizers Handbook 1952. Lyon’s Irisland, Lyon Iris Gardens, 1953. Stevens Bros. Catalogue, Wanganui, Novelties 1957-1958. STARSHINE (J. Wills U.S.A.) You probably have admired the beautiful indescribable tints of the last twilight rays of the evening sky many times. This Iris embodies these shades in an unusual coalition of pearly blue and deep cream and white with an over-all iridescent gleam. A very subtle pastel, yet retains a distinctive character. Illustrated on our cover (see below). 3½ ft. A.M., A.I.S. 1951. More recent other three equally striking creams, each very different in tone, ARMNDINE (Douglas 1946), which is cream flushed with palest lemon, BELLERIVE (Benson 1949), of the smoothest cream and wonderful form, and DESERT SONG (Fay 1946), which is a sandy cream. They are all excellent plants and three of the finest irises there are. STARSHINE (Wills 1949), which won the recent instituted Romney Towndrow statuette for irises of exceptional beauty of form, is scarcely as good as they. Its colour is basically cream but it has a curious opalescence which gives it a sort of shimmering aura of other colours, and it is certainly a beautiful colour. Of its form, however, the best that can be said is that it is a good example of typical current fashion, was slightly waved and horizontally flaring falls and domed standards. It lacks the dignified formal beauty of CARVED IVORY, and equally it lacks the dragonfly-like poise of PHARAON, or the svelte distinction of MATA HARI. It is nevertheless a good garden plant. The Josephine Romney Towndrow Trophy was awarded for the first time and much interest was caused by the method adopted for selecting the winner. A small committee was formed including the donor Mr K. Romney Towndrow. Being himself a artist, he stressed the ideal to be aimed at but at times it was difficult not to let colour influence one's judgement. I should think that every bloom in the show was seen by the committee and then a selection of possibles removed from their exhibits and placed in one glorious row ; seven of the most stately irises one could possibly see ; STAR SHINE, PIERRE MENARD, 2006 (Morris), BLUE ENSIGN, CLIFFS OF DOVER, ARCTIC SNOW and 50/105 (Fothergill). Mr Jesse Wills is to be congratulated on raising STAR SHINE, which was finally acclaimed "the Iris of the year", and Mr H. J. Randall on the growing and staging of such a fine specimen. Cooleys Gardens, Silverton, Oregon. Iris Catalog 1958. Marble Iris Gardens catalog, 1962. STAR SHINE (Wills, 1949) 38” M-L . Soft pastel shades of cream, buff, and muted blue, blended into a pearly combination. the falls flare out horizontally and the branching is wide. This is an Iris that never succumbs to the elements and has great distinction in both quality of bloom and arrangement of color. 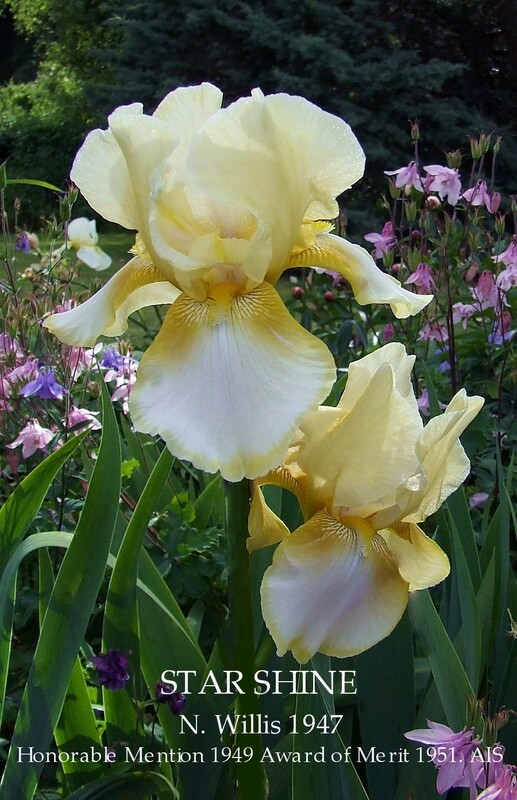 THE WORLD OF IRISES, Chapter 4 ‘The Pot of Gold’ ; The banner year for yellows was 1949 with the release of two remarkable varieties that received international recognition. Jesse Wills introduced Starshine, a dreamy Iris in subtle pastel cream, buff and muted blue. Starshine came from a Hermitage-Hernani seedling crossed to Song of Gold and soon gained a worldwide reputation as an Iris with perfect form. Fay’s ‘Truly Yours’, with large ruffled flowers, its heart bright yellow blending to almost white at the petal edges, received the Dykes Medal in 1953. IRISES, Judith M. Berrisford, Newer Irises for the Exhibitor and Collector. STAR SHINE (Wills, 1949) 38” M-L. This Iris was adjudged the Iris of the Year in 1953. It is really a bicolour. The standards are deep cream with white falls faintly tinged was blue. There is also a faint blue edging to the standards. ‘Star Shine’, is a first-rate Iris for exhibition but it needs all the sunshine you can give it to make it flower freely. An Iris for your sunniest spot. Bulbs, A complete handbook of Bulbs, Corms and Tubers, Roy Genders. STAR SHINE Tall growing, its flowers have a delicate beauty unlike that of any other variety, being a subtle blending of soft blue, cream and buff, producing a pearl-like appearance. STAR SHINE J. Wills, 1947 TB 38" M-La-W6L rev. ((Hermitage x Hernani) X Song of Gold), HC 1948, HM 1949, AM 1951. This Iris was known and Catalogued as STAR SHINE and STARSHINE both listings are the same plant. The iris shows various levels of Purple coloured foliage at the base of the plant. I say this as I have seen several plants from different sources which show strong PBF and some with seasonal PBF but all the same variety. In New Zealand it was listed a couple of years ago by a seller on Trade Me but is definitely not a grower I would recommend to anyone.